The aim of this study was to study the relationship between serum level of soluble tumor necrosis factor-related apoptosis-inducing ligand (sTRAIL) and the disease activity in patients with systemic lupus erythematosus (SLE) and also to compare sTRAIL levels between patients with lupus and patients with rheumatoid arthritis as well as healthy volunteers. A search was performed in Medline databases (PubMed, Medscape, Science Direct, and EMF-Portal) and all materials available in the Internet from 2000 to 2017. The initial search presented 18 articles of which eight met the inclusion criteria. These articles studied the relation between sTRAIL and the disease activity in patients with SLE. If the studies did not fulfill the inclusion criteria, they were excluded. Study quality assessment included whether ethical approval was gained, eligibility criteria specified, appropriate controls included, adequate information provided, and assessment measures defined. Comparisons were made by structured review with the results tabulated. In total, eight potentially relevant publications were included, and all were human studies. The studies had demonstrated elevated serum concentrations of sTRAIL in patients with SLE and their association with disease activity, which suggest an important role for TRAIL in the pathogenesis of SLE. Serum level of sTRAIL was significantly higher among patients with active SLE as compared with those of other groups and positively correlated with disease activity. Systemic lupus erythematosus (SLE) is an autoimmune disease with a broad spectrum of clinical and immunological abnormalities. The presence of autoantibodies, especially those directed to double-stranded DNA, is characteristic of the disease. The disease affects different organ systems, including the skin, joints, nervous system, kidneys, and the liver. Many theories suggest that the accumulation of apoptotic cells play a major role in autoimmunity and development of the disease. The course of the disease is ultimately changeable More than 90% of cases occur in women, frequently starting at childbearing age. Apoptosis (programmed cell death) is an active physiological process that leads to the ordered destruction of cells without the release of intracellular contents which would cause an inflammatory reaction and tissue damage into the extracellular environment. It can be induced passively, through lack of essential survival signals, or actively, through ligand-induced trimerization of specific death receptors of the tumor necrosis factor (TNF) receptor family, such as Fas, TNF receptor, or TNF-related apoptosis-inducing ligand receptor. Tumor necrosis factor-related apoptosis-inducing ligand (TRAIL, APO-2 ligand) is a transmembrane type II glycoprotein. Like TNF and FasL, TRAIL also exists physiologically in a biologically active soluble homotrimeric form. TRAIL can interact with five different receptors, namely, two agonistic receptors called death receptor-4 (DR4/TRAIL-R1) and DR5/TRAIL-R2 (referred to as TRAIL-R1 and TRAIL-R2, respectively), two membrane-anchored decoy receptors (DcR) designated DcR1/TRAIL-R3 and DcR2/TRAIL-R4 (referred to as TRAIL-R3 and TRAIL-R4, respectively), and a soluble decoy receptor known as osteoprotegerin,. TRAIL triggers apoptosis through interaction with the death receptors TRAIL-R1 and TRAIL-R2 that contain a cytoplasmic death domain and can induce apoptosis through the activation of caspases upon ligation with a TRAIL ligand. Nevertheless, the binding of TRAIL to these TRAIL receptors can also activate the transcription factor NFκB, which is known to control cell proliferation. Indeed, although TRAIL is known to induce apoptosis in tumor cells, it has also been shown to promote endothelial cell proliferation. Thus, depending on the cellular system, TRAIL is capable of initiating apoptosis or cell survival. It induces apoptosis in a variety of transformed or cancer cells and also of HIV-infected lymphocytes, normal monocytes, neutrophils, and macrophages. The role of TRAIL in neutropenia of SLE is unclear; it was reported to be involved in the monocytes apoptosis induced by T cells in SLE. It was also proved that TRAIL could accelerate apoptosis of neutrophils. It was stated that apoptosis could be induced passively, through lack of essential survival signals, or actively, through ligand-induced specific death receptors of the TNF receptor family, such as Fas, the TNF receptor, or the TRAIL receptor. Since the 1980s, increasing attention has been devoted to the problem of finding a valid and sensitive tool for measuring disease activity in SLE. The more commonly used measures include the Systemic Lupus Erythematosus Disease Activity Index (SLEDAI), which was developed in 1985. It has 24 items, of which 16 are clinical. Activity categories have been defined on the basis of SLEDAI scores: no activity (SLEDAI = 0), mild activity (SLEDAI = 1–5), moderate activity (SLEDAI = 6–10), high activity (SLEDAI = 11–19), and very high activity (SLEDAI = 20). Recent several studies in patients with SLE have demonstrated elevated serum concentrations of sTRAIL and their association with disease activity (SLEDAI) of SLE. These findings suggest an important role for TRAIL in the pathogenesis of SLE. The aim of this study was to detect the relationship between serum level of soluble TRAIL (sTRAIL) and the disease activity in patients with systemic lupus erythematosus (SLE) and to compare sTRAIL level between patients with lupus and patients with rheumatoid arthritis as well as healthy volunteers. The guideline for conducting this review is according to guidance developed by the center for review and dissemination. It was used to assess the methodology and outcome of the studies. We reviewed papers on the role of TRAIL in patients with SLE from Medline databases (PubMed, Medscape, and Science Direct) and also materials available in the Internet. We used TRAIL and SLE as searching terms. In addition, we examined references from the specialist databases EMF-Portal (http://www.emf-portal.de) and reference lists in relevant publications. The search was performed in the electronic databases from 2000 to 2017. Focused on the role of TRAIL in patients with SLE. Data from each eligible study were independently abstracted in duplicates using a data collection form to capture information on study characteristics, interventions, and quantitative results reported for each outcome of interest. Conclusions and comments are provided for each study made. There was heterogeneity in the collected data. 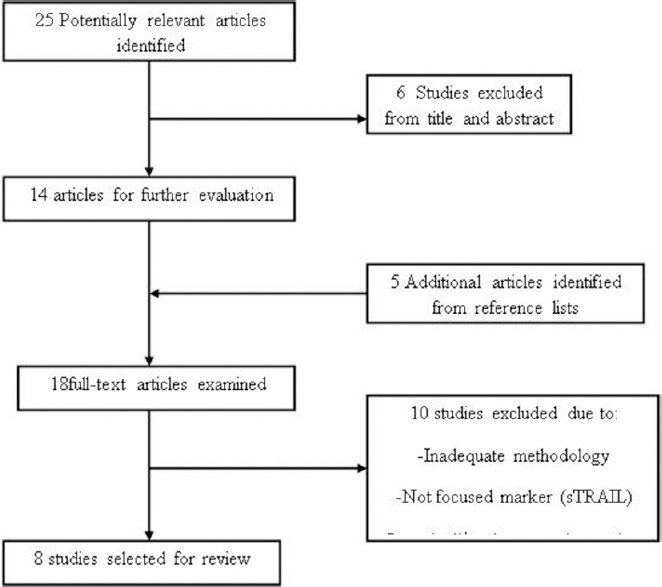 It was not possible to perform meta-analysis. Significant data were collected. Thus, a structured review was performed with the tabulated results. The analyzed publications were evaluated according to evidence-based medicine (EBM) criteria using the classification of the US Preventive Services Task Force and UK National Health Service protocol for EBM in addition to the Evidence Pyramid. The quality of all the studies was assessed. Important factors included study design, attainment of ethical approval, evidence of a power calculation, specified eligibility criteria, and adequate information and specified assessment measures. It was expected that confounding factors would be reported and controlled for the appropriate data analysis made in addition to an explanation of missing data. A structured systematic review was performed with the tabulated results. In total, 18 potentially relevant publications were identified. Eight of these articles were included in the review as they were deemed eligible by fulfilling the inclusion criteria. The eight articles included in this review were human, case–control studies. The studies were analyzed with respect to the study design using the classification of the US Preventive Services Task Force and UK National Health Service protocol for EBM [Figure 1],[Figure 2],[Figure 3]. 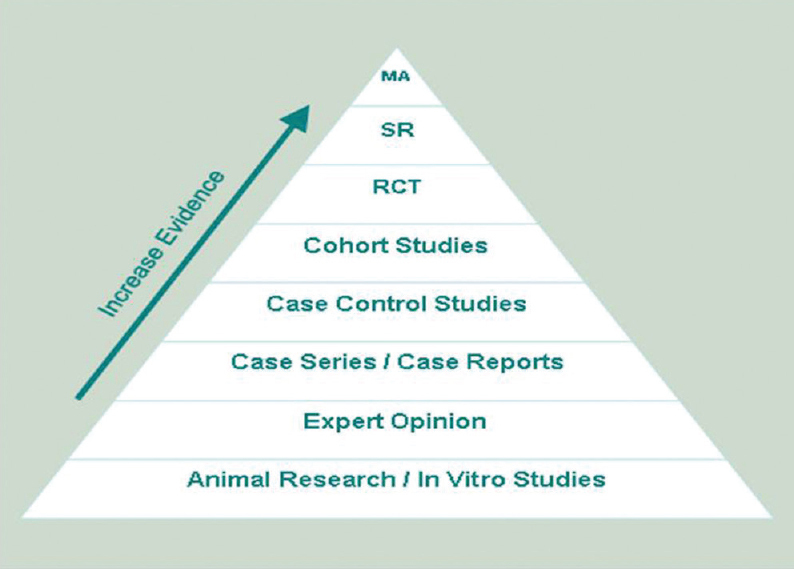 Figure 1: The pyramid of evidence-based medicine. RCT, randomized controlled trials. SR, systematic reviews. MA, Metaanalysis. Figure 2: Flow chart of study selection. sTRAIL, serum tumor necrosis factor-related apoptosis-inducing ligand. Figure 3: Significant negative correlation was found between serum tumor necrosis factor (TNF)-related apoptosis-inducing ligand (TRAIL) (pg/ml) levels and neutrophils count (×109/l) in JSLE during disease activity. A total of eight studies demonstrated sTRAIL in patients with SLE. One of these studiesreported increased serum soluble Fas (sFas) and TRAIL, whereas reduced sFasL in juvenile-onset systemic lupus erythromatosus (JSLE). Another study reported increased serum sTRAIL concentrations in patients with SLE and suggested a role for TRAIL in SLE pathophysiology. Other studies,,, [Figure 3] reported that an increased level of TRAIL is a feature of SLE that correlates with disease activity and anti-dsDNA whereas negatively correlated with neutrophils counts. Moreover, it was found that serum TRAIL levels in patients with SLE with neutropenia and nephritis were significantly higher than those of patients with SLE without neutropenia as reported by other studies,,. Moreover, another study demonstrated increased T-cell surface expression and soluble protein release of TRAIL in patients with SLE with active disease [Table 1]. Two of the included studies estimated sTRAIL level in patients with SLE and compared between patients with lupus and those with other autoimmune diseases regarding sTRAIL level. One study reported that increased serum sTRAIL concentrations in patients with SLE were disease specific and could play a role in SLE pathophysiology. The other one found that serum TRAIL level in patients with SLE was elevated than in patients with other autoimmune diseases [Table 2]. Research in serum concentrations of sTRAIL in patients with SLE is an area in which there are a significant number of scientific studies in both within national and international research programs, in both public and private laboratories. This study tried to briefly describe recent studies, classify them, and evaluate them according to EBM criteria. Patients with SLE had elevated serum concentrations of sTRAIL, and their association with the pathogenesis of SLE and correlation with the SLEDAI had been demonstrated. One study worked on 48 patients with JSLE, 33 patients with juvenile idiopathic arthritis (inflammatory controls), and 40 healthy controls. sFas, sFasL, sTRAIL, and sBcl-2 serum levels were measured by enzyme-linked immunosorbent assay. Disease activity parameters including SLEDAI score, ESR, anti-dsDNA antibodies, C3, and C4 levels also were measured. They found that sTRAIL levels were significantly increased in patients with JSLE with neuropsychiatric disease compared with those without this involvement (median: 667.9 vs. 216.2 pg/ml) and correlated with SLEDAI score. 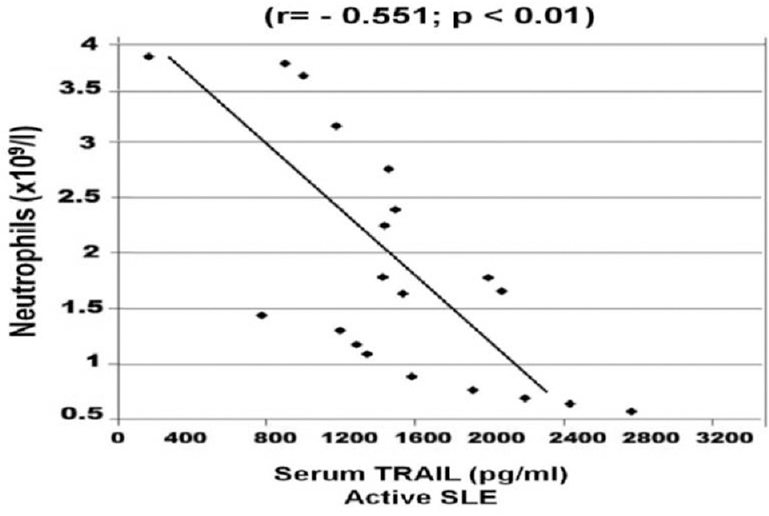 One study (a case–control study) had reported that serum sTRAIL concentrations were increased in patients with SLE and seems to be disease specific and could indicate a role for TRAIL in SLE pathophysiology. The study included 20 consecutive patients with SLE with inactive disease and 20 patients with SLE with active disease, consecutive patients with rheumatoid arthritis and Wegener's granulomatosis, and healthy volunteers (n = 20). They found high sTRAIL concentrations in the serum of patients with SLE compared with healthy volunteers and patients with rheumatoid arthritis or Wegener's granulomatosis. This observation suggested that increased serum sTRAIL levels are disease specific for SLE. Another study reported that an increased level of TRAIL is a feature of JSLE that correlated with disease activity, anti-dsDNA titers, neutropenia, and lupus nephritis. They worked on 40 patients with JSLE (20 with active and 20 with inactive disease) and 20 controls. They found that the mean (SEM) serum TRAIL concentration in JSLE was 1750.7 pg/ml. The serum TRAIL concentrations in patients were significantly higher than those in controls and also correlated with SLEDAI score and biomarkers of disease activity (ESR and anti-dsDNA levels). They found also that children with JSLE with positive anti-dsDNA antibodies had significantly higher serum TRAIL levels. Moreover, serum TRAIL levels correlated positively with the anti-dsDNA autoantibodies titers. However, no clear relation between serum TRAIL concentrations and renal, cerebral, cutaneous, serosal, hematological, or hepatic manifestations was found. The study concluded that serum TRAIL level plays an important role in pathogenesis of JSLE particularly in lupus nephritis and neutropenia. One study analysis reported that serum TRAIL levels showed a significant negative correlation with neutrophil counts in children with JSLE and positive correlation with laboratory variables of renal involvement. They found that serum TRAIL concentrations were significantly higher in children with classes III and IV nephritis compared with those with classes I and II nephritis. They also found that serum TRAIL levels were significantly correlated with biomarkers of disease activity, namely, ESR and anti-dsDNA, and they concluded that an increased level of TRAIL is a feature of JSLE that correlates with lupus nephritis because all children during disease activity showed significant positive correlations between serum TRAIL values and serum creatinine and 24-h urinary protein excretion. On the contrary, serum TRAIL levels correlated inversely with the estimated creatinine clearance. One national study worked on 50 patients with SLE, 30 patients with diagnosed rheumatoid arthritis (n = 15) and Wegener's granulomatosis (n = 15), and 10 healthy volunteers as control group. Patients with SLE were defined as 27 patients with inactive and 23 patients with active SLE. Preliminary laboratory investigations were defined. They found significant positive correlation of blood levels of anti-dsDNA antibodies with serum TRAIL whereas a significant negative correlation with leucocytic and neutrophil counts. These data indicated a possible role for TRAIL in neutrophil apoptosis associated with SLE activity. Another study found that sTRAIL levels in patients with SLE with neutropenia were significantly higher than those of patients with SLE without neutropenia and healthy volunteers and showed a significant negative correlation with neutrophil counts in patients with SLE. However, they reported that PMNs from patients with SLE expressed all TRAIL receptors on their surface and the expression pattern of TRAIL receptors in PMNs from healthy volunteers was almost the same as that of patients with SLE. One study (case–control study) demonstrated increased T-cell surface expression and soluble protein release of TRAIL in patients with SLE with active disease. Enhanced TRAIL-mediated apoptosis by surface-bound and sTRAIL may be an important intermediary in systemic autoimmunity. These results support the potential use of TRAIL as a biomarker and therapeutic target in patients with SLE. One international study reported that sTRAIL concentration in patients with SLE and mean TRAIL mRNA expression level were significantly higher than those in healthy controls. They worked on 18 patients with SLE and 20 healthy subjects. They found increased expression of TRAIL in patients with SLE. In this study, SLE activity was assessed by SLEDAI. Patients who had more than four scores on SLEDAI were considered to have mild to very high activity. This review indicates that sTRAIL was significantly higher among active SLE cases than those of other groups and was negatively correlated with hemoglobin, platelets, leukocytes, neutrophils, C3, and C4 (P < 0.001), whereas positively correlated with urea, creatinine, antinuclear antibodies and anti-dsDNA, and SLEDAI score. sTRAIL were significantly higher in SLE cases with nephritis and neutropenia than those without nephritis or neutropenia (P < 0.05). Choi MY, Barber MRW, Barber CEH, Clarke AE, Fritzler MJ. Preventing the development of SLE: identifying risk factors and proposing pathways for clinical care. Lupus 2016; 25:838–849. Ben M, Ian NB. systemic lupus erythematosus and autoimmunity. Rheumatology 2015; 54:383–391. Arasteh JM, Sarvestani EK, Aflaki E, Amirghofran Z. Fas gene polymorphisms in systemic lupus erythematosus and serum levels of some apoptosis-related molecules. Immunol Invest 2010; 39:292. Choi JW. Associations of Fas (CD95), tumor necrosis factor (TNF)-related apoptosis-inducing ligand (TRAIL), and biochemical manifestations in elderly persons. Clin Chim Acta 2006; 365:113–118. Castellino G, Corallini F, Bortoluzzi A, La Corte R, Lo Monaco A, Secchiero P, et al. The tumor necrosis factor-related limited systemic sclerosis: a new disease marker? Rheumatol Oxford J 2010; 49:1173–1176. Jing G, Dongsheng W, Dan L. Tumor necrosis factor-related apoptosis-inducing ligand induces the expression of proinflammatory cytokines in macrophages and re-educates tumor-associated macrophages to an antitumor phenotype. Mol Biol Cell 2015; 26:3178–3189. LeBlanc HN, Ashkenazi A. Apo2L/TRAIL and its death and decoy receptors. Cell Death Differ 2003; 10:66–75. Kim HS, Chang I, Kim JY, Choi KH, Lee MS. Caspase-mediated p65 cleavage promotes TRAIL induced apoptosis. Cancer Res; 2005; 65:6111–6119. Maria DSN, Alberto BM, Sara G, Ana BS, Alvaro CU, Maria CI, et al. TNF superfamily: A growing saga of kidney injury modulators. Mediators Inflamm 2010; 2010:11. Nguyen V, Cudrici C, Zernetkina V, Niculescu F, Rusb H, Drachenberg C et al. TRAIL, DR4 and DR5 are up regulated in kidneys from patients with lupus nephritis and exert proliferative and proinflammatory effects. Clin Immunol 2009; 132:32–42. Rus V, Zernetkina V, Puliaev R, Cudrici C, Mathai S, Via CS. Increased expression and release of functional tumor necrosis factor related apoptosis-inducing ligand (TRAIL) by T cells from lupus patients with active disease. Clin Immunol 2005; 117:48–56. Truneh A, Sharma S, Silverman C, Khandekar S, Reddy MP, Deen KC. Temperature sensitive differential affinity of TRAIL for its receptors. DR5 is the highest affinity receptor. JBiol Chem 2000; 275:23319–23325. Kaplan MJ, Lewis EE, Shelden EA, Somers E, Pavlic R, McCune WJ. The apoptotic ligands TRAIL, TWEAK, and Fas ligand mediate monocyte death induced by autologous lupus T cells. J Immunol 2002; 169:6020–6029. Wataru M, Masuki Y, Ikkou H, Ken-ichi O, Masaki W, Kentarou M, et al. TNF-related apoptosis-inducing ligand is involved in neutropenia of systemic lupus erythematosus. Blood J 2004; 104:184–191. Wiley SR, Schooley K, Smolak PJ, Din WS, Huang CP, Nicholl JK. Identification and characterization of a new member of the TNF family that induces apoptosis. Immunity1995; 3:673–823. Gladman DD, Ibañez D, Urowitz MB. Systemic lupus erythematosus disease activity index 2000. J Rheumatol 2002; 29:288–291. Petri M, Orbai AM, Alarcón GS, Gordon C, Merrill JT, Fortin PR, et al. Derivation and validation of the systemic lupus international collaborating clinics classification criteria for systemic lupus erythematosus. Arthritis Rheum 2012; 64:2677–2686. Mohamed HME, Tarek MA, Kareem YAS, Ramzi AM, Mervat SMY. Up regulation of serum tumor necrosis factor-related apoptosis inducing ligand in juvenile-onset systemic lupus erythematosus: relations with disease activity, antibodies to double -stranded DNA, nephritis and neutropenia 2013. Int J Rheum Dis 2013; 16:310–318. Mervat SM, Yousef MHM, Ezzat TMA. Serum tumor necrosis factor-related apoptosis inducing ligand in juvenile-onset systemic lupus erythematosus. Life Sci J 2013; 10:835–842. Liphaus BL, Kiss MHB, Carrasco S, Palmeira P, Goldenstein-Schainberg C, Carnerio SM. Increased serum sFas, sTRAIL, and reduced sFasL in juvenile-onset systemic lupus erythematosus Clin Rheumatol 2017;1–6. De hoogeMNL, Devries EGE, Dejong S, Bijl M. TRAIL concentrations are raised in patients with systemic lupus erythematosus. Ann Rheum Dis 2005; 64:854–858. Komatsuda A, Wakui H, Iwamoto K, Togashi M, Maki N, Masia R, et al. Up regulation of TRAIL mRNA expression in peripheral blood mononuclear cells from patients with active systemic lupus erythematosus. Clin Immunol 2007; 125:26–29. Mamdouh A, Faysal O. A possible role of serum soluble TNF-related apoptosis-inducing ligand (TRAIL) in pathogenesis of systemic lupus erythematosus. Bull Egypt Soc Physiol Sci 2008; 28:1. Matsuyama W, Yamamoto M, Higashimoto I, Oonakahara KI, Watanabe M, Machida K, et al. TNF-related apoptosis-inducing ligand is involved in neutropenia of systemic lupus erythematosus. Blood 2004; 104:184–191. Violeta R, Valentina Z, Roman P, Cornelia C, Susan M, Charles SV. Increased expression and release of functional tumor necrosis factor-related apoptosis-inducing ligand (TRAIL) by T cells from lupus patients with active disease. Clin Immunol 2005; 117:48–56.